I love this quote. Yes, nature, mother earth, and the abundance of our planet has allowed us humans to survive, thrive and flourish. But we have reached a critical moment in our history where we are using (and wasting) far more than can be provided at a sustainable rate. We, as humans, must learn to control our appetites, and consume only what is necessary to satiate our true needs. Let’s have a look at some of our most harmful production and consumption practices. Agriculture is the biggest user of water worldwide, with irrigation claiming close to 70% of freshwater appropriated for human use. We also know that agriculture and intensive farming practices cause the devastating loss of natural habitats and ecosystems, soil degradation, water pollution, and this industry is the largest contributor of non-CO2 greenhouse gas emissions. Whew. Whilst food production is well and good for an ever-growing population, we really need to find ways in which to sustain ourselves, without destroying our only home. 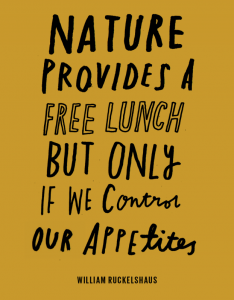 Despite the huge amount of food produced, a staggering amount of it never even makes it into our homes, or our stomachs. 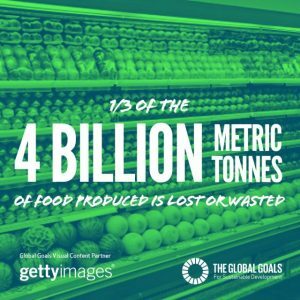 One third of the food produced, the equivalent of 1.3 billion tonnes, is wasted every single year. This number makes me quite sick to my stomach. 1.3 billion tonnes of food rots away in bins of retailers and consumers, or is spoiled due to poor transportation methods and harvesting practices. This is something that needs to change, now. Some other areas of extreme consumption, plus unsustainable production practices, which don’t match up to the status of eco-friendly (not by half), are that of energy – specifically household energy use, and the fashion industry. Let’s light upon household energy for a second. According to the UN Sustainable Development Goals, “When it comes to consumers, households consume 29 per cent of global energy and contribute to 21 per cent of resultant CO2 emissions. However, if people worldwide switched to energy efficient light bulbs the world would save US$120 billion annually.” That doesn’t seem like it’s a particularly difficult switch to make, does it? But look at the possible impact we could all have! So now, fashion. An industry which has faced backlash for more breaches of environmental and ethical practices than I could possibly go into here, so I will remain focused on just the waste, for today. It is the second largest polluter of clean water, after agriculture. Water pollution comes from the toxic chemicals and pesticides used in cotton farming, the dyeing of fabrics with synthetic dyes, the use (and breakdown) of plastic-based textiles (here’s looking at you, polyester! ); all this destruction, for an item of clothing that is worn (on average) only seven times before it is thrown away! I hope this makes as little sense to you as it does to me…surely something so disposable isn’t worth so much harm to the environment? So these are some of our most harmful consumer practices, and just a few of the reasons why ‘responsible production and consumption’ is goal number 12, for the Sustainable Development Goals. Read about the targets for this goal here. Whilst I am fully aware that we can only work our way out of this crisis point with massive, industry-scale reform in production practices, I am also aware that industry leaders are not reading this blog. And so, I am directing this to you, our readers, and regular consumers, in the hope and faith that we can keep championing greener, more plant-friendly initiatives (even if only on a small scale). 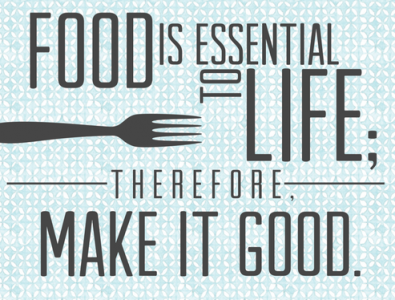 Today, let’s focus on food. Good food. What does that mean? For many, that means unprocessed, responsibly sourced, locally grown, seasonal produce. (I’m not going to start offering dietary advice here). And remember, organic! If you need to remind yourself of why organic farming helps protect our soils, and indeed, why our soils are so important, be sure to pop back and read “Be the Solution to Soil Pollution”. Community gardens are popping up all over the country, providing hubs of green-space for people to come together, learn new skills, and grow some fresh produce. Gardening also provides a multitude of physical and mental health benefits, so perhaps it’s time to…dig in. 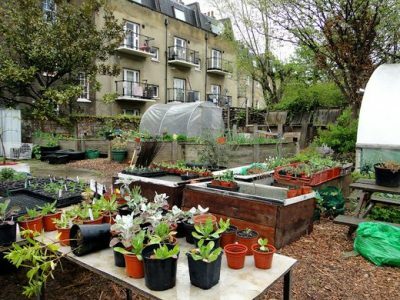 Use websites such as NCVO Know How, for resources on how to set up a community garden, and Farm Garden, to find gardens near you. School gardens or edible playgrounds are bringing the joys of homegrown to students, and teachers alike, in schools country-wide. 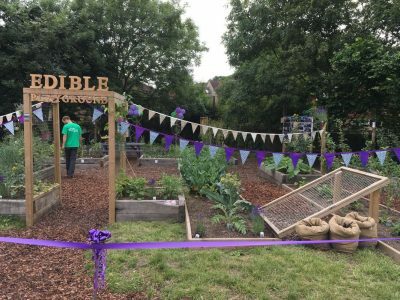 Particularly beneficial for inner-city students, edible playgrounds have been studied and proven to bring a host of fantastic learning opportunities, for teaching moments outside of the classroom. Schools are catching on to the idea that gardening provides a safe, green-place, where the students can grow alongside their veggies. Trees for Cities have a fantastic range of resources, and have worked with schools to create 75 edible playgrounds – benefiting 30,000 students in the UK. Whilst I know that community gardens aren’t going to suddenly reverse the destructive impacts of current agricultural practices, I want to highlight the small, conscious actions that we can make and engage in. Even if these actions don’t have global consequences, it can mean the world of difference to your local environment. Let’s bring back these community schemes, support local, and encourage hands-on involvement. After all, protecting our planet really comes down to reconnecting with, and maybe re-planting, our roots.